U.S. sanctions are exacting a heavy toll on an already angry Iranian citizenry. The Iranian rial has fallen to record lows, economic activity has slowed dramatically and hundreds of companies have suspended production and laid off thousands of workers since U.S. sanctions were re-imposed on the Islamic Republic, Reuters reported on Nov. 20. Official projections indicate unrest could flare up again in Iran as U.S. sanctions make the economic crisis worse. U.S. President Donald Trump, after withdrawing from the nuclear deal in May, imposed sanctions directed at purchases of U.S. dollars, gold trading, and the automotive industry in August. This month, Iran’s vital oil and banking sectors were hit. 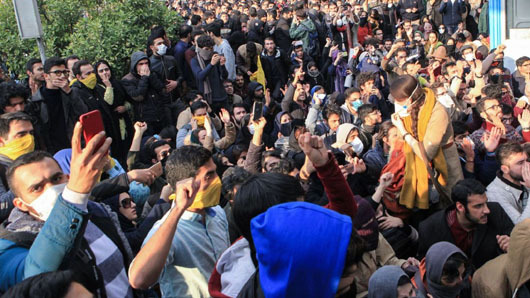 Iran has already been hit by widespread unrest this year, with young protesters angered by unemployment and high prices clashing with security forces. Official projections indicate unrest could flare up again as sanctions make the economic crisis worse, the Reuters report said. An Iranian company that makes fizzy drinks, Tamnoush, told Reuters that it has shut down its production line after 16 years and laid off dozens of workers. It was facing massive losses as U.S. sanctions pushed up the price of imported raw materials. The International Monetary Fund has forecast that Iran’s economy will contract by 1.5 percent this year and by 3.6 percent in 2019 due in large part to dwindling oil revenues.